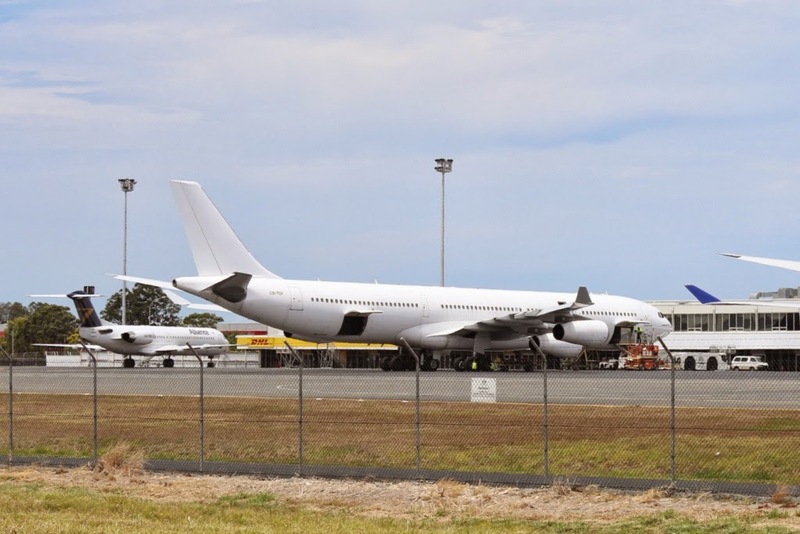 January started with a series of Royal Australian Air Force (RAAF) visits with multiple Airbus A330-203 / KC-30A (MRTT) aircraft touching down to conduct crew changes, as well as Boeing C-17A Globemaster III missed approaches. The end of January, Qantas Airways Boeing B737-800 VH-VXE, which was operating flight QF974 flying from Brisbane to Townsville, was forced to divert to Rockhampton Airport and conduct an emergency landing due to a cabin pressure issue. On Tuesday 29 January, Rockhampton Airport actually had two Qantas B737-800s on the ground at once, with VH-VZZ ferrying in to complete the QF974 service during that evening. Australia Day saw record rain falls around the region with the Rocky Airport being shut for one day in early February due to part the runway being underwater near the Southern end. As numerous roads were closed, it was helicopter-city at Rockhampton Airport, ferrying people to and from work at Gracemere and neighbouring properties. The first flight back into Rocky when the Airport re-opened was a QantasLink Dash-8-Q300 from Mackay. Pel-Air SAAB 340A Freighter VH-EKT was broken down for a few days due to a hydraulic fluid leak during mid-February. March saw more RAAF action with more KC-30A / MRTT missed approaches. 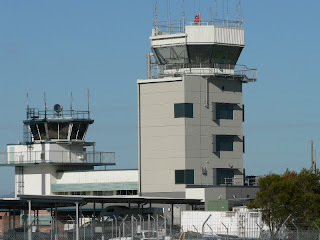 Also, the new air traffic control tower at Rockhampton Airport was officially opened on Friday 8 March by the Federal Member for Capricornia, Kirsten Livermore and Airservices Australia Chief Executive Officer, Margaret Staib. 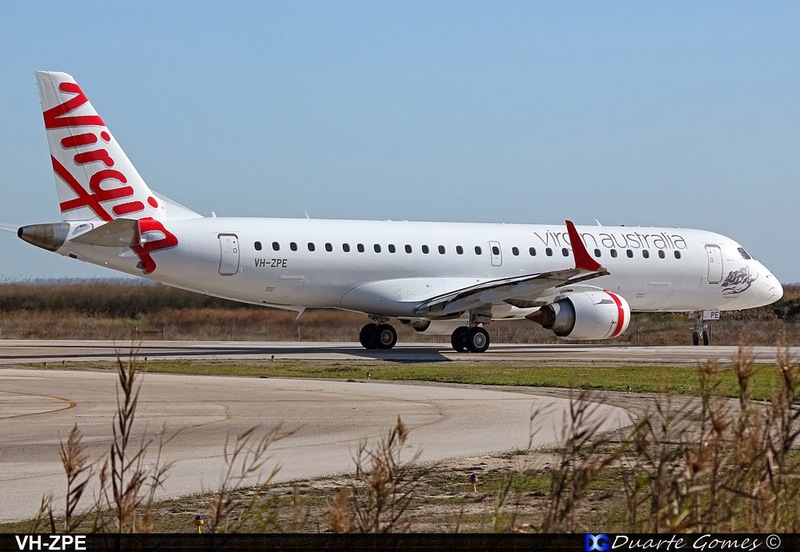 Finally, Virgin Australia announced that direct jet services between Rockhampton and Sydney would cease at the end of April. April started with yet more RAAF action with a few Boeing B737-7ES / E-7A Wedgetail Airborne Early Warning & Control (AEW&C) aircraft and C-17A Globemaster III visits. April also signalled the start of the advanced parties for upcoming joint Australian / American military exercise Talisman Saber 2013 (TS13), with visits from United States Air Force (USAF) Beech C-12J Huron 86-0082 and Dornier C-146A 10-3077. 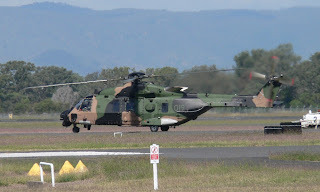 Near the end of April, Australian Army Commonwealth CA-32 (Bell 206B/OH-58A) Kiowa helicopters were spotted visiting, along with RAAF Canadair Challenger 604 A37-002. 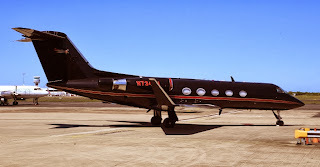 Finally, at the end of April, Gulfstream G-IV N524AN and Bombardier Challenger 604 VH-EVJ touched down at Rockhampton Airport, bringing Australian golfer Greg Norman, and other representatives who were to travel to Great Keppel Island where Tower Holdings are developing a new resort. May signalled the build up to TS13 with numerous visits into Rocky by various Australian Army Helicopters - Tigers, Blackhawks and MRH90’s - along with numerous RAAF King Air turbo-prop arrivals. Rockhampton also had a visit by a pair of Grey RAAF Pilatus PC-9/A trainer aircraft, which did markings up at the Shoalwater Bay Training Area (SWBTA). Near the end of May, Rocky played host to six Royal Australian Navy (RAN) helicopters - four Aerospatiale AS350B Squirrel choppers and two of the RAN's newer Bell 429 choppers. There were also yet more RAAF jets that conducted missed approaches during May. Finally, Clive Palmer popped into Rocky right at the end of May, and CQ Plane Spotting was lucky to be the first publish photos of 'Palmer United Party' colour scheme which adorned his bizjet - Global Express M-ATAR. 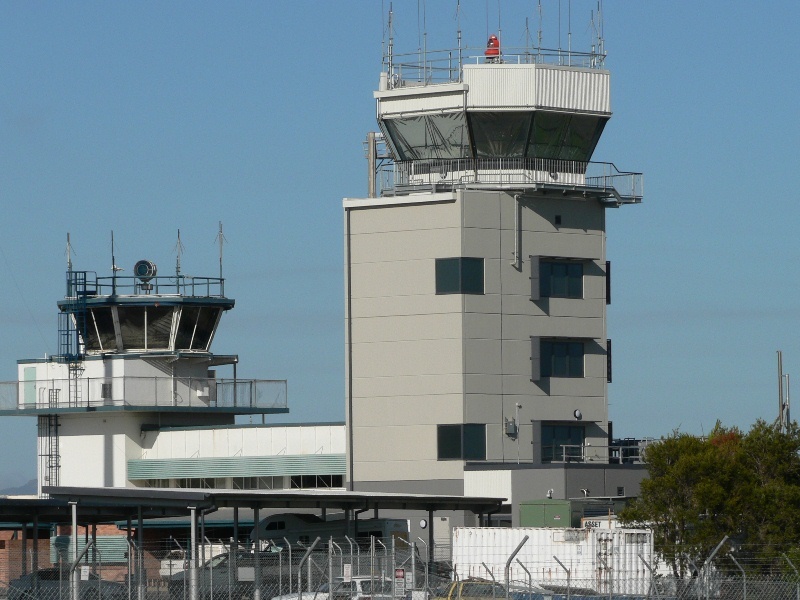 The biggest news for Rockhampton Airport in June was the introduction of 'Rocky Approach' on 123.75. This essentially saw Rockhampton airspace with the associated Control Area Steps now active 24-hours-a-day. There was yet more build-up to TS13 in June with more Army helicopters and RAAF King Air aircraft visiting, along with the usual RAAF C-17A Globemaster III missed approaches. 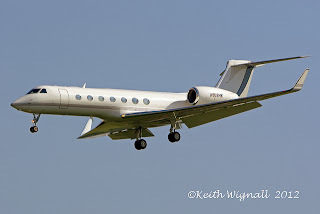 In the middle of June, Crown Gulfstream G-V bizjet VH-CCC paid Rockhampton a visit. Finally, one of the more unusual sites was Aviation Utilities / Geotech Airborne Eurocopter AS.350B3 Squirrel helicopter VH-VTX which was photographed towing a massive airborne electromagnetic receiver coil. My sincere thanks to 'IAD' for compiling this great article and sending it through. 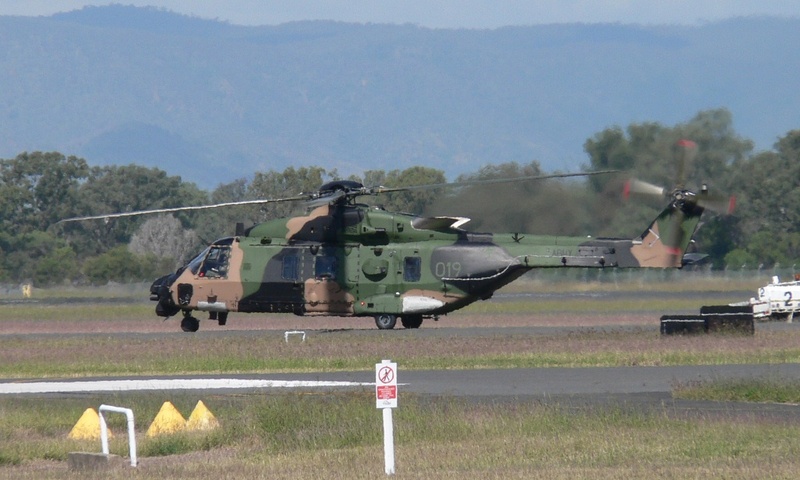 The second part of 'The Year in Review' from July to December was a particularly busy period with both Military Exercise Talisman Saber 2013 and the Singapore Armed Force's Exercise Wallaby 2013 seeing Rockhampton Airport playing a significant supporting role. 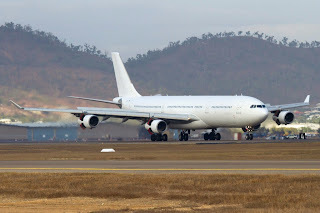 At the start of December, the Australian Defence Force (ADF) said "good-bye" to their current troop transportation aircraft, after the all-white Airbus A340-313X CS-TQM departed Brisbane on a flight to Don Muang International (Old Bangkok International) Airport. It has been reported that CS-TQM will eventually be scrapped. CS-TQM was leased by the ADF from HiFly, a Portuguese-based airline that specialises is charter flights and aircraft leasing. HiFly was once known as Air Luxor, and the ADF has utilised aircraft from HiFly / Air Luxor since the early 2000's. 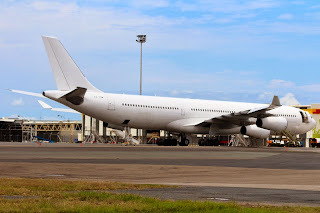 One previous Air Luxor-operated aircraft that flew for the ADF - Airbus A330-322 CS-TMT - was captured by me at Rockhampton Airport during Military Exercise Talisman Sabre on 5 July 2009. Interestingly, CS-TMT now flies for the Belgian Air Force, and has done so since late-2009. 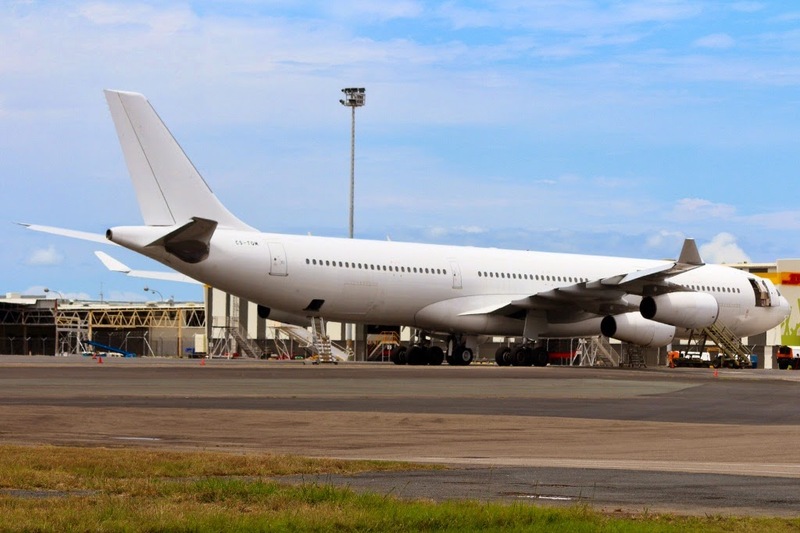 A340 CS-TQM has operated in Australia for the ADF flying to Middle East at least once a week from Airports all over Australia - from Perth, to Adelaide and Darwin, and right up and down the East Coast of Australia. Local plane spotter Dave was able to photograph CS-TQM at Townsville numerous times over the years - as shown below from one recent visit. 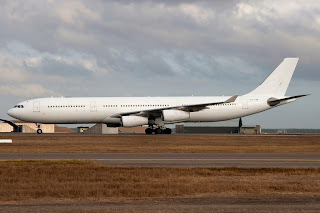 During periods of maintenance, CS-TQM would be replaced by other Airbus A340 aircraft including OY-KBM (which is now in service with Scandinavian Air System - SAS) and CS-TQL (which has subsequently been scrapped). Most recently, fellow HiFly A340-313X CS-TQY has been ferried into Brisbane and has commenced operations with the ADF, continuing the weekly charter flights to the Middle East. 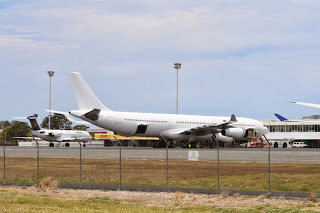 Brisbane-based plane spotter Brendan B has sent through a couple of photos of CS-TQY as it rested at the Old International Terminal Building (OITB) at Brisbane Airport shortly after its arrival into the country. They flights usually use the ADF / Royal Australian Air Force (RAAF) International flight radio callsign of "Ausy" / 'ASY'. 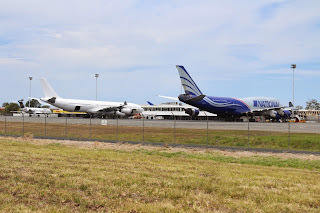 Finally, one of Brendan's other recent photos from Brisbane that features CS-TQY also features another interesting large aircraft that was leased by the ADF. The Boeing B747 in the striking blue and silver livery was in fact being utilised by the ADF to transport equipment back home from the Middle East. 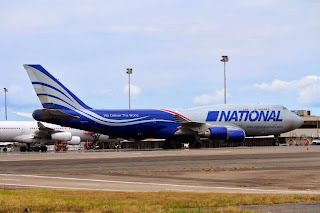 The aircraft was National Airlines Boeing B747-428(BCF) N919CA. Certainly a lovely looking aircraft, and a real treat for Brisbane plane spotters to capture such a rare movement. I believe this was only the second visit of a National Airlines B747 freighter into Brisbane. If only we had more like this Central Queensland!! Sincere thanks to Brendan and Dave for sending through their great images and allow me to share them with you!! A very sleek looking bizjet in the form of FlyJock Gulfstream G-III N734TJ touched down at Hamilton Island Airport on Monday 30 December from Sydney. It later departed to Cairns - where it was captured by the Far North Queensland Skies Blog - and later back to Sydney. The G-III has been in Australia for the last few days, and is apparently operated by a well-known American radio announcer. Meanwhile, also touching down at Hamilton Island on Monday 30 December was Aeromil Pacific / Flight Options (Australia) Cessna 650 Citation III bizjet VH-SPJ. It arrived from Bankstown and later departed to Sydney. And at the time of writing, VH-SPJ is due back into Hamo on Tuesday 31 December from Sydney. Also due in much later in the afternoon is Business Aviation Solutions Cessna 650 Citation VII VH-LYM, which is due to arrive from the Sunshine Coast, and due to later depart to Mackay. 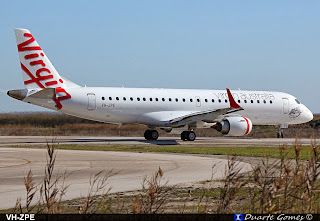 Virgin Australia Embraer E-190 VH-ZPE returned to Australia from overseas wearing its new colours - and the name "Coogee Beach" - and immediately returned to service flying into Central Queensland twice on Thursday 26 December. VH-ZPE initially flew into Proserpine / Whitsunday Coast Airport from Brisbane operating the VOZ1113/1114 service, before flying into Mackay from Brisbane as VOZ607/610. Sister-ship VH-ZPF is expected to follow, flying to Europe for maintenance and re-painting in early 2014. Incidentally, Virgin Boeing B737-800 VH-VUC has also been noted now in new colours after re-painted in Townsville. A bit of a mystery aircraft popped into Hamilton Island Airport on Tuesday 24 December when TAG Aviation Asia Gulfstream G-V-SP (G550) N818HK touched down from the Gold Coast as SJM01. 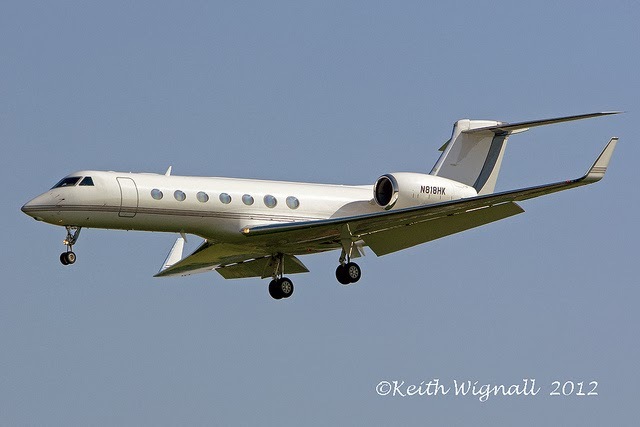 The Gulfstream is unable to be tracked on most Internet-based flight tracking resources, and is believed to be carrying American movie couple Brad Pitt and Angelina Jolie. Jolie is in Australia presently making a movie. It is believed that N818HK departed Hamiliton Island on Friday 27 December to Melbourne. 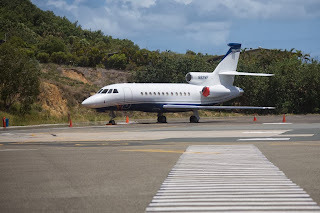 Meanwhile, my father-in-law John has sent through a photo of the visiting private Dassault Falcon 900EX N82MF which touched down at Hamilton Island last Sunday 22 December. Finally, Shortstop Jet Charter British Aerospace BAe-125-1000B VH-LMP again visited Hamo briefly on Saturday 28 December, arriving from the Gold Coast and departing to Melbourne (Essendon). UPDATE! It appears as though VH-LMP diverted to Albury on its journey South. It eventually made it to Essendon later in the evening. Local plane spotter Michael F was on hand to capture a great series of photos of Virgin Australia Regional Airlines (VARA) ATR 72-500 VH-FVU as it made a bouncy arrival into Gladstone Airport last week. Certainly some great photos from Michael, and we thank him sincerely for taking the time to send them through! New Jetstar Airways Airbus A320SL VH-VFX Visits Hamilton Island Airport too! And to follow-on from our Blog post below, Jetstar Airways new Airbus A320SL VH-VFX also popped into Hamilton Island Airport on Saturday 28 December. VH-VFX operated the JST852/855 service to Hamo from Brisbane. At the time of writing, it looks to be again operating into Hamo today on Sunday 29 December too! It's also worth mentioning that Jetstar has fellow A320SL VH-VFV, however it has yet to make an appearance in CQ! 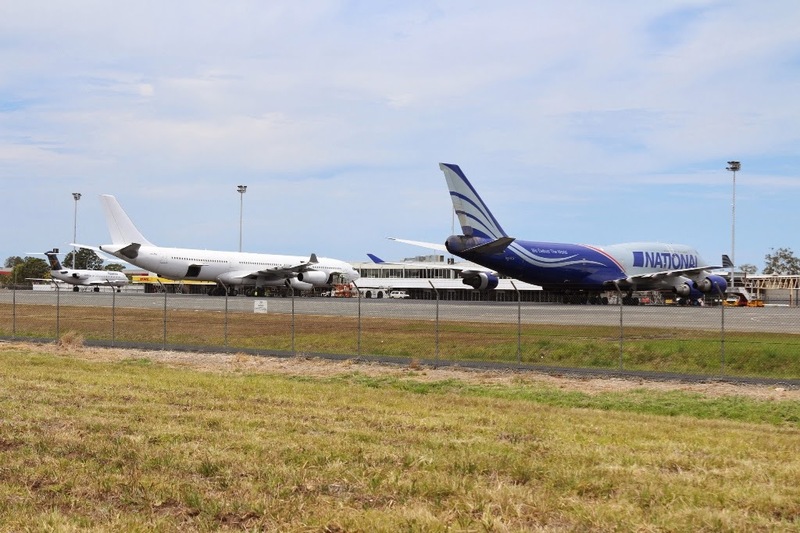 The Gladstone Observer newspaper has recently reported that the much anticipated instrument landing system (ILS) at Gladstone Airport is having difficulty getting off the ground. The ILS system recently underwent a weekend of extensive flight testing and calibration by AirServices Australia Hawker Beechcraft B300 Super King Air VH-FIZ. Initial projections estimated that the $10.5million investment would be up and running by the end of 2013, however this will not be the case. The Gladstone Airport Corporation has said that the project required further tests before it could be launched. They are looking at a deadline in February of 2014. In 2011, GLNG, QCLNG, APLNG and Arrow Energy injected funds into the project, after it was found that plumes from projects on Curtis Island could interfere with the safe landing of aircraft. Gladstone plane spotter Jamie C has sent through some wonderful images of QantasLink Dash-8-200 VH-TQX as it recently operated a scheduled service into the industrial city. The smallest Dash-8 type aircraft in the QantasLink fleet - capable of carrying 36 passengers - was a rare visitor into Gladstone on this occasion due to the breakdown of a Cobham Aviation-operated Boeing B717-200. Visits into Central Queensland of QantasLink Dash-8-200s are becoming quite rare - there are currently only five in active service with QantasLink - and they generally operate into Biloela / Thangool Airport and sometimes Roma and Bundaberg Airports. They also fly QantasLink's services to and from Lord Howe Island out of Brisbane and Sydney. Some great photos from Central Queensland's premier aviation photographer, and we thank him sincerely for taking the time to send them through!